The U.S. Ambassador to New Zealand is also accredited to Samoa. 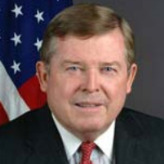 Currently this is William P. McCormick, who presented his credentials on November 9, 2005. McCormick was born in Rhode Island and attended Roger Williams Jr. College and Boston University. After graduation he moved to Northern California, where he worked for Connecticut General Life Insurance Company as a broker until 1965. He then left the insurance business and became a partner in the Refectory Steak House Restaurant chain. He sold out of that and moved to Oregon where, in 1973, he purchased “Jake’s Famous Crawfish” restaurant and partnered with Doug Schmick. They changed the name to McCormick & Schmick’s Seafood Restaurants and eventually opened 56 restaurants in 24 states. Meanwhile, McCormick attended the Harvard Graduate School of Business, Executive Management Program, in 1979. McCormick & Schmick’s Seafood Restaurants is now publicly traded on NASDAQ and McCormick is Chairman Emeritus. McCormick has been heavily involved in charitable and service projects. These have included providing thousands of pounds of food for a food bank and 10,000 books for disadvantaged children in Los Angeles County. He started the Shamrock Run to benefit many service organizations in Portland, Oregon. He also raised money to keep the Portland Opera Foundation functioning. McCormick and Schmick’s restaurants provide complimentary meals to veterans visiting the restaurant on Veteran’s Day, for which he received the Secretary’s Award from the U.S. Department of Veteran’s Affairs. McCormick was also appointed to the President’s Committee of the Arts and Humanities. He was also Bush for President Finance Co-Chair, the Oregon Chairman for the Republican National Committee Finance Committee, and a heavy donor to the Republican Party and its candidates.